You are currently browsing the tag archive for the ‘RCTs’ tag. Alex Counts is the President and CEO of Grameen Foundation and a biographer of Muhammad Yunus, the Grameen Bank founder. Given his position in the large network of Grameen, he holds sway in the microfinance world and beyond. So when he publishes an attack on independent research on his blog, I take to represent a reasonably broad antiscience sentiment in the microfinance industry. In his article, the head of Grameen Foundation laments the emergence of “a new generation of researchers” rising to “debunk the myth of microfinance being an effective tool to fight poverty” (I consider myself part of this generation, but I’m sure Counts doesn’t mean me). He writes about a “conflict” between researchers and practitioners, questions whether practitioners are to blame for not having brought researchers into the fold, says researchers have supported sensationalist reporting against microfinance, and claims they have not tried to contribute (enough) to poverty alleviation. Then he delves into an elogy for Tim Ogden, head of the Financial Access Initiative at NYU. The overall message – research results which don’t support microfinance should be disregarded; the title-giving Haiti cue is a bit of a red herring – is akin to a call to sticking one’s head in the sand when threatened. 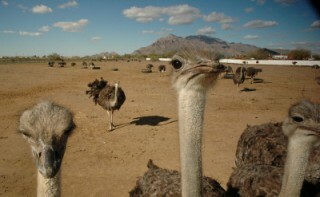 The ostrich, unlike the microfinance CEO, is falsely believed to stick its head in the sand when it feels threatened. Image: Bob Jagendorf/Wikimedia Commons CC BY-SA 3.0. A parody of Rumsfeld from the (massively under-appreciated) comic series “The Boondocks”. Warning: coarse language. In terms of twisted logic, Rumsfeld was right: the fact that intelligence couldn’t find conclusive proof for WMDs in Iraq didn’t necessarily mean they weren’t there; their available methods simply weren’t good enough to find them. But empirically, of course, he was wrong: as we now know, the reason why no proof was found for the WMDs was, they simply weren’t there. Fast-forward to 2011, to a debate about the evidence for positive impacts of microfinance. Six British researchers recently published an exhaustive study (actually a Systematic Review, S.R. ); as I explained on this blog, they pulled together all existing 2,643 publications about microfinance’s impact and looked in depth at the best 58. London: EPPI-Centre, Social Science Research Unit, Institute of Education, University of London. A new systematic review of the evidence on microfinance, published last week, is dynamite for the world’s most popular development policy. Madeleine Bunting of the Guardian has already referred to it as “microfinance’s sober reckoning”, likening the findings to a “hangover after a big party”. Bangladeshi news calls it a “damning report”.